This post is by Lauren Zimmerman. I just noticed a piece of hers that I reposted here two years ago, so I clicked over to check in with her and found what follows. It seems a perfect follow-up to my ‘Vibe Dip’ post (and provides good clues as to its meaning), and speaks to the process of transmutation, which I’ve blogged about on numerous occasions. She likens transmutation to a gradual “walk-in” experience (your higher self pours more and more into your earthling self). 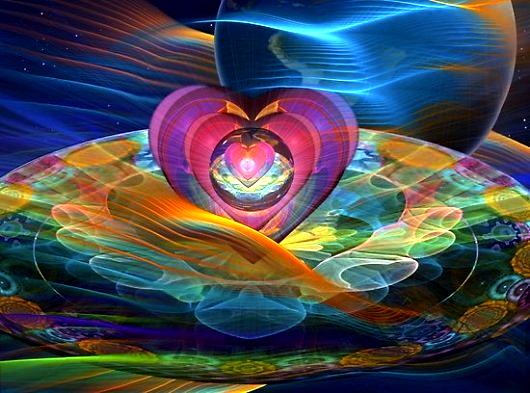 This blog is for those who ‘know,’ for those who, on whatever level within themselves, remember that they came to this incarnation with the intention of learning about the process of evolving from one vibrational frequency to another. A brief explanation … everything is energy and all energy has a frequency/vibration. Not only are we infinite souls who exist throughout all that is, but we exist in many different vibrational frequencies. In other words, we are not limited to being just this temporary 3-D body-of-the-moment. Add to this the fact that we have existed, as souls, for however many years, centuries, eons. With that as a Truth, it would be impossible to assume that we came to this incarnation without any understanding or awareness of what we were doing. Add to this that we were fully aware that the Earth itself would be transitioning. This time on Earth is, to my understanding, monumental. As it was told to me, by The Presence of God, there will be 1,000 years of the human race creating and evolving into a different reality. 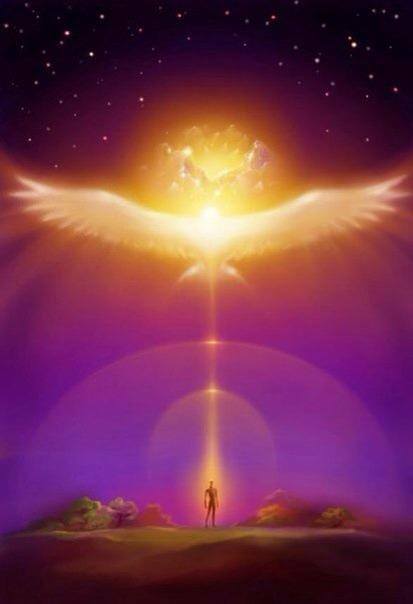 A spiritually-based reality that brings to the forefront the Divine Union of not only God but Soul, with full awareness and conscious interaction with both. The topic I’m about to discuss would probably end up being a 1,000 page manuscript if I were to let myself tell you all that I’ve experienced regarding this topic. It will be painful to not share it all (smile) but in the interest of brevity, I am going to touch upon the highlights that I feel it’s important to share in this moment. If you doubt my sanity, after reading what I have to say, please refer to all of the books, writing, etc. that I’ve shared through the years. Everything I’m about to tell you is as real as it gets. This is a quickie to pass along a moment of sweet enchantment. I just googled “desolation trail” and up came all the online info about this trail in Utah. 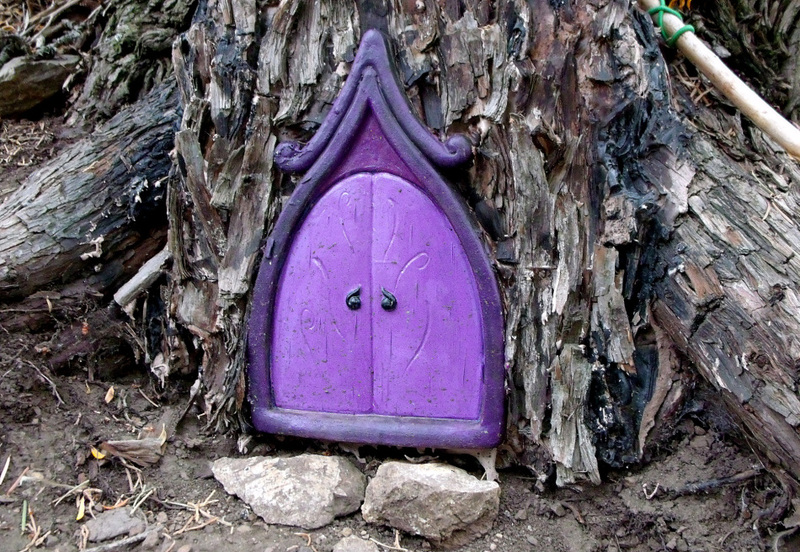 I saw this darling photo of a little purple fairy door, created by a hiker to adorn the base of a tree on the trail — how sweet is this? I clicked through to the source of this image, and found a blog post about the writer/photographer and his son’s subsequent revisit to this trail about a year later. Look what they found had become of this tree! Last night I had the pleasure of attending a dinner party where many in attendance are doing exceptional spiritual work in the world, and for the most part they seem supported by the world they serve, which is always nice and not always easy. One guest, a well-established author with a special focus on near-death experiences, shared that she worked and worked and worked for decades, researching this field extensively, all the while wondering when she’d at long last be recognized by “authorities” (medical? scholarly? not sure just whom she was hoping to impress enough to gain entrance into a particular strata of professional associates). All these years she had her eyes on what she called the “gold ring” of respect and recognition beyond what might typically be considered (by the establishment) as “fringe groups.” Earlier this year, someone – apparently someone in a position to help her gain access to this type of recognition – told her it would never happen. This slam devastated her… flattening her for a couple of weeks before she picked herself up and carried on. Anyway, after feeling like a “splat on the ground” for a while, our author friend rallied and declared herself FREE of that whole dream, or possibly expectation, of being lauded for her contributions in the manner she really craved. She’s still on her own path, but just no longer in anticipation of the longed-for Grand Prize. I wasn’t expecting to get off into that here, it just came out while reflecting on the evening, but I’m leaving it in, in case anyone has a similar challenge going on. Out here on the fringe, the satisfaction of being taken seriously can certainly remain a gold ring out of reach. The question is, can you live with that scenario and keep plugging away, or do you shelve all that matters to you and “sell out” to the mainstream value system? Or might that not even be an option at this point? Greetings friends. Today I’m sharing a piece by author, shaman, dream journeyer extraordinaire Robert Moss. 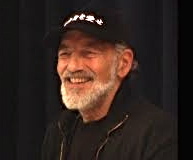 He’s penned some of the best material about dreaming and consciousness around. This is from his blog, linked at the end. 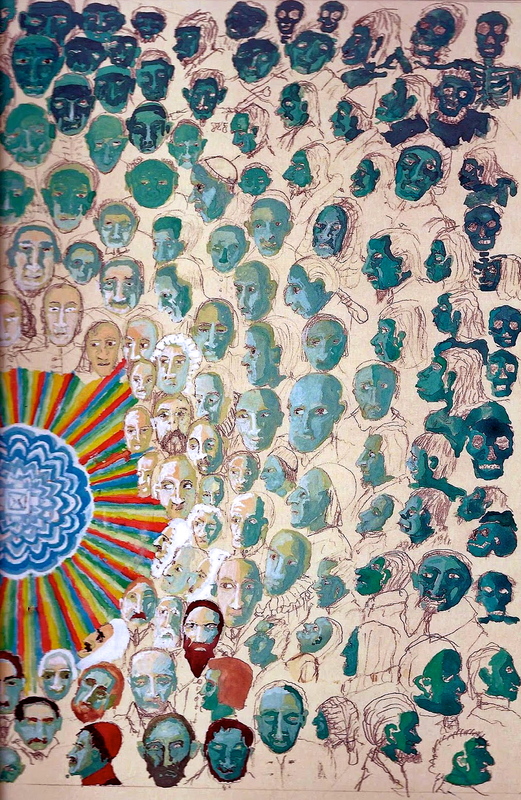 Today Moss’s subject is Jung’s plunge into some very dark depths, as he (Jung) journaled about in his amazing self-penned and self-illustrated Red Book, which he stipulated in his will should not be released for public consumption until something like 50 years after his death. I believe passages like this point to Jung having had a kundalini awakening, and all the bizarreness that active K can bring. I also believe that it was his unrelenting exploration of consciousness that triggered it–same as I believe re: my own experience. That same strength of his courage to go deep is also what brought him through. So often, questing spirits think kundalini is all about the bliss, but it will typically bring up every iota of NOT BLISS that the human psyche (and body) holds to be witnessed, felt, and reconciled. Kundalini is probably more about purging every physical, psychological, and spiritual nook and cranny than anything else! … which frees one to be who/what they REALLY ARE beneath all the wounding – a gleaming fractal of the ONE. If you choose to venture into Jung’s Red Book, I strongly advise you to do so more cautiously than I did. I stayed with it for three days and nights, without much sleep, following Jung on his Underworld journey. There was one moment, in particular, when I became very angry with him. He recounts a vision in which he comes upon the mutilated corpse of a murdered girl, and this fills him with grief and rage. A veiled woman appears and tells him he must remove the child’s liver and eat part of it, to atone for the crime. He must take on the guilt, because he is a man and a man was responsible. Jung writhes in resistance, disgusted and horrified, but finally complies. Evocative piece from “Letters of Love and Madness” at the Write with Spirit website. A mystic is a wild creature. She is made. She is deliberately forged by something mysterious. She is created for a purpose. She spends all her life seeking, for there is nothing else worth doing. She peers and gazes until she falls from the edge of the world, and into the next. Over and over. Each time she returns, she is a little different. What she sees must change her. She dies every day. 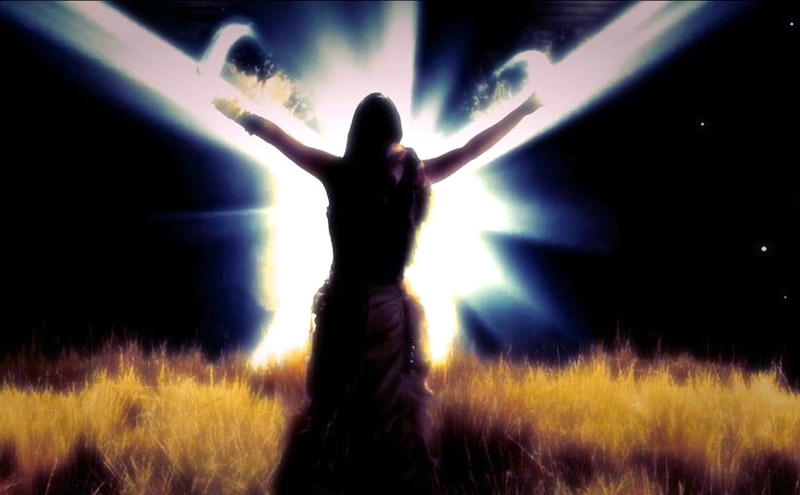 She is reborn in every moment. Can you even begin to fathom the terror and the faith commanded from such a being? Can you even begin to understand what such a life can do? Don’t date a mystic, if you want the life you have. If you are comfortable and cozy, stay away. Whatever you have built around yourself to create comfort: it cannot stand in the blazing fire of a mystical woman. She is no trophy. She is no bodily pleasure-maker. She is the seer of souls. 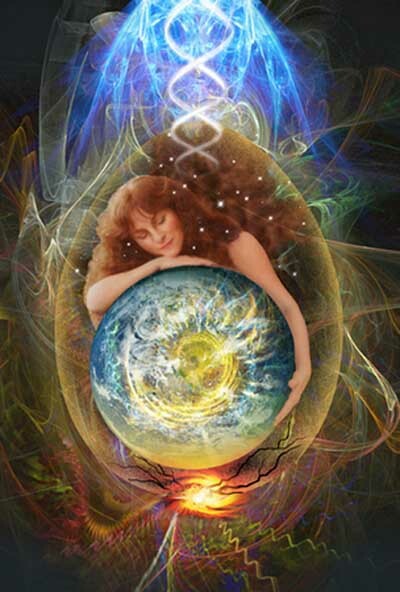 She is the womb that births the divine into the flesh and bone of matter. So, for instance, you can decide—within the dream—that you’d prefer the action to continue in another setting, such as on a beach instead of in a city bus. Or you could physically alter or swap out various characters or animals in the plot line, or (this is a lucid dreamer’s favorite) – you can fly at will. The article I’m sharing here is from the World of Lucid Dreaming website, the impressive brainchild of an accomplished lucid dreamer named Rebecca. It’s so in-depth and loaded with graphics that support her explanations, I’m providing only the beginning of it here. You can click over to her site to continue reading if you wish. Rebecca also offers a free lucid dreaming course that might interest you to opt-in for. Meanwhile, if exploring the 5th dimension is your cup of tea, I think you’ll enjoy what follows. I have not seen Interstellar (tho now I’m interested! 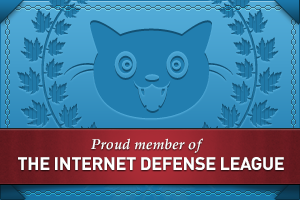 ), but this didn’t detract from my appreciation of her illuminating post. 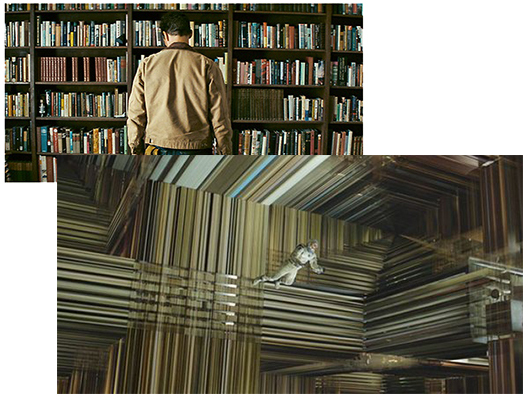 The Interstellar bookcase in three dimensions (top) and then planted spatially in five dimensions (lower). One of the most enthralling concepts in Chris Nolan’s Interstellar is when the hero, Cooper, travels into a black hole. Once inside the greatest mystery of the universe, Cooper begins to perceive reality in five dimensions. Count them. 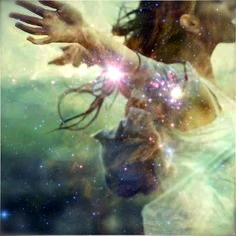 The ‘Twin Flame’/’Twin Soul’ experience is so very difficult to understand, let alone try to explain. People assume you’re talking about a ‘soul mate,’ you’re waxing overly romantic about someone, you’re ‘head over heels,’ etc. My own TF experience was intense, compelling, and the most mystifying connection imaginable. It wasn’t remotely like any other meeting you might have with someone, or a connection shimmering with a little ‘energy’ that you feel inspired to look into a bit more. For me this was a spontaneous soul meld that threw me for a loop. I couldn’t be casual about it; I had to go deeper. And deeper. And deeper still. One has to be intrepid to explore this depth of connection. No two ways about it. Eventually, though, it was necessary to let go of the whole thing. After years of exasperating entanglement I had to face the reality that the whole ordeal was causing more pain than the mutual healing that I originally “knew” we had met to accomplish. It all just became unbearable to perpetuate. We did not attain the state of grace we could have, if *whatever* had been *different. * But it was what it was, and ultimately it wasn’t pretty. Today I look back and just can’t believe what went on during that strange period. I now refer to it as my “so-called twin flame” experience. I know what this connection “should” be – wide-open fearless love, which the ego is typically too terrified to allow. I was in an exalted space of divine love. I was also in a state of awakened kundalini, which can be a lonely condition when you’re swimming in divine bliss and the Other is in mundane, habitual ego. Maybe Lissa Rankin’s piece about her TF relationship will help illuminate this connection that fits no known container. It’s not what so many expect or fantasize it to be! 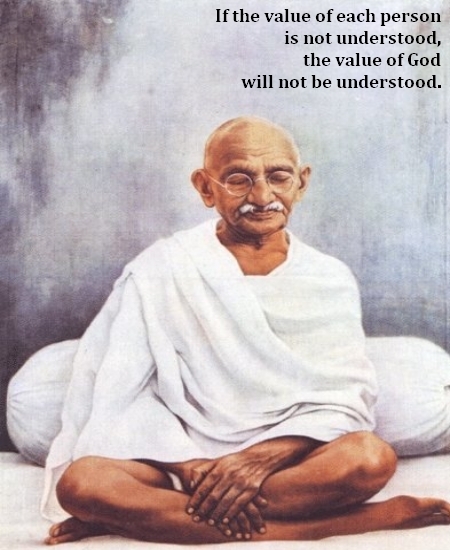 This just cannot be compared with anything that came before it, in terms of human relationships. This is a foreign relational universe. It’s where souls merge (or where two parts of one greater soul merge), if squirmy little human egos can just let them. I delve much more into this subject in my upcoming book. Meanwhile I’m happy to post the following from Lissa Rankin. I haven’t written much about it publicly because it’s been so intense and confusing and extraordinary, but for almost a year, I have been involved in what others describe to me as a “twin flame” or “soul twin” relationship. Dennis and I are not a “couple” in any traditional sense of the word. He’s a gay man. I’m a straight woman. Both of us have recently experienced divorces from our partners, so we are technically “single,” but a number of factors keep us from getting involved in a typical romantic relationship. And yet, we are both learning more about love than either of us ever had in our other conventional relationships. Free Will or the Whirlwind? On December 15, 2014, Uranus in 13 degrees Aries squares Pluto in 13 degrees Capricorn, while Chiron in 13 Pisces exactly sextiles Pluto. This configuration will release the deepest truths and healing powers of the god of the underworld, Pluto. With Chiron in Pisces traveling with Neptune, the square to Pluto from Uranus forces potent transformation of patriarchal power structures that created the deep conflicts and obsessions of the Piscean Age. This “chirotic” healing process has been intense since 2010 when Chiron went into Pisces and then travelled very close to Neptune through 2012, which inspired humanity to seek freedom. The patriarchy is still entrenched and standing in the way of human freedom, while the seven Uranus/Pluto squares have been steadily eroding its financial and political basis. This deep work was largely unconscious until the April grand squares, but now this deep process is becoming conscious exponentially. Apocalypse means “revelations”; suddenly, the emperor has no clothes. Surprisingly and delightfully, with this Sixth Uranus/Pluto Square, the antidote—compassion—will be given. We will see many amazing events this winter that I cannot even imagine; somehow we will forge new paths and gain momentum. The law of the yin and the yang is inviolable, so we know many things will be very dark; however, intense light will balance it like the golden halos of saints and angels. What is this “End Times Window” of 2011-2014 Really About? A new interview with one of my primary go-to people for “extreme” information – “Galactic Historian” Andrew Bartzis, interviewed on online TV program Buzzsaw by Sean Stone (son of filmmaker Oliver Stone). As always, Andrew goes deep, far, and wide instantly; the viewer has to pay attention to grasp these ideas! I really felt for Stone, having to keep up with Andrew’s outpourings of rather alien info and follow up with more questions… but he holds his own and shapes our experience. This post ventures into highly unusual waters. The keyhole glimpse I’m offering here (a peek into what quickly telescopes out into a massive volume of daunting strangeness) involves a man named Alan Krakower, who became spontaneously immersed in an extraordinary mystical experience in 1987. An overwhelming … entity? … consciousness? … seized control of him and did not relinquish that control for 7 days and 7 nights, during which time profound and mystifying things happened to him – physically and mentally. What’s more: his dog was rendered unconscious and stayed, unmoving, under a table during the entire duration of “the experience,” which took place in an abandoned ruin (“ruina”) of a building on the island of Ibiza, Spain. Alan thought his dog was dead… but was helpless to do anything other than just BE with what was happening at the time; there was no other option until he was “released” on the 8th day. Greetings friends – reposting a message from Sandra Walter that mentions today (Dec. 7) as a ‘wave trigger’ day. Not sure how this has been determined, but I share the info for those who might feel moved to acknowledge the accelerated shift today. I find it interesting to hear Sandra – one of the most avid and vocal cheerleaders of this cosmic event – admit to having challenges handling the frequencies of late. I personally have been experiencing a seemingly unprecedented blast of difficult strangeness (with a few extraordinarily divine interludes) for weeks.